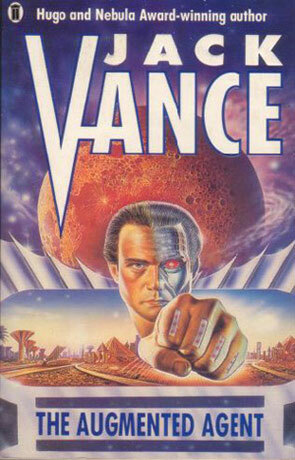 The Augmented Agent is a collection of science fiction short stories by Jack Vance. Jack Vance:I read the intro and.....Basically it was a campaign for Vance heroes as regular fellas running around and doing incredible things to the environment they are written into with wits and brains rarely employed before. Vance takes all kinds, usually not the genetically perfected sexless mastermensch, and works them into stories, rarely using knuckleheads as main characters. There's one Laurel and Hardy type story in here "Three Legged Joe" that he has some bumble freindly fukups learning about 3 legged Joe on a remote ore site. That story wasn't very good. The rest of the book is old carefully worded dynamite fun. The last story "The Augmented Agent" is along the lines of the mentor 'wizard' in LANGUAGES OF PAO. A reworked human with hidden tech devices all over his body, transmitting via tooth to a help from above for assistance. The Agent is set in Africa with a Parliament leader's face and is trying to set the course for the future of the country with a spilling waterfall of other enemy augmented agents skillfully knocking on doors and transmitting information themselves, James Bond style pens slashing. The story "The Planet Machine" is a nice apocolypse planet designed to kill everyone on it with a malfunctioning computer who needs some kind of hobby to distract itself from a janitor joe type getting some repair to it. Real fifties kinda stuff and really well written. "Sjambak" was about the Malay-Arab planet some reporter is sent to. He's to cook up a story around a mad bare chested arab riding a horse in space, locate and exploit. Trying to woo the locals with all the spy cell cloth weave by bragging he can make aluminum from clay and a paralyzer gun with some foil, transistors and a battery in some bamboo. "The Man from Zodiac" is about this guy who takes on a contract to help some backwards barbarians build a government who want to run amok in other's pastures. They are semi lazy and want long range missles to do the work and find a sort of cooperative evolution/destruction of their backyards is the only thing that can get the ball rolling. The story is delivered like a cold narrator explaining the painfully obvious simplicity of the barbarians dealing with the crafty 'hero' in simplistic ways and ending up with eggs on the face until they cooperate. Another contract from a different company has the opposing city (B) of barbarians and has to establish a government there too. They want bombs to blow up barbarian city(A). The words spoken in dealing with these war hungry nuts have to be said specifically to twist the minds to thinking they are getting ahead of the other guys without being ego stomped. Vance at his dryest wit. Crafty trapeze act of words spinning around the dagger ready, war import hungry, b-barians. A brilliantly written short. "Shape Up" is a who dunnit, which reminds me Vance used to write for ELLERY QUEEN. His tactic of putting a handfull of weapon quick guys in a room for a job interview to find out who stole what when. Blood samples included. Well this whole book is A-ONE brilliant except that 3 L. Jo which gets a okey dokie just for trying to set comic elements in it and using for once a pair of goofs for main characters. Written on 21st August 2004 by number 6.